These 14K gold blue sapphire baguette and diamond earrings from Apples of Gold Jewelry will shine with a stunning color combination that you won't be able to resist! 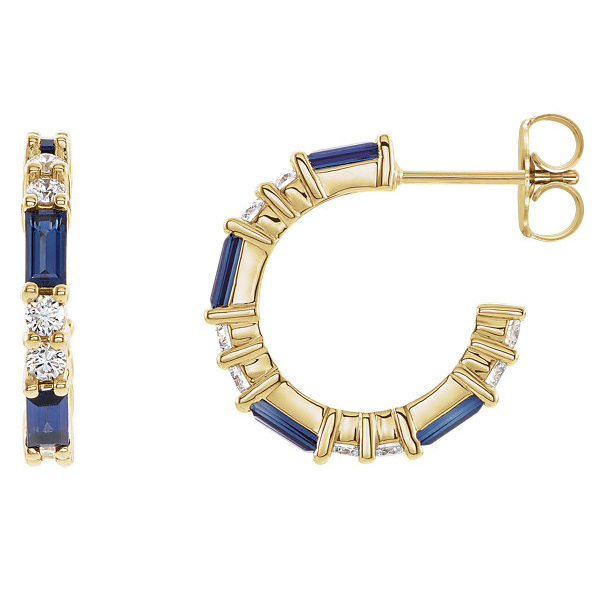 The beautiful earrings are designed in 14K yellow gold and feature authentic, deep blue sapphire gemstones as well as dazzling diamonds that are sure to make you fall in love! The earrings, which are made to order, are 11/16" in length, and feature post and push-back closures. The baguette-cut blue sapphire gemstones are 4mm by 2mm each in size, are faceted, and rated AA quality. The 16 diamonds, which alternate with the sapphire stones to create a lovely pattern, are 0.03 carats each for a total of 0.48 carats. The diamonds are G-H for color and I1 for clarity, and look absolutely brilliant against the warmth of the 14K yellow gold earrings. We guarantee our 14K Gold Blue Sapphire Baguette and Diamond Earrings to be high quality, authentic jewelry, as described above.